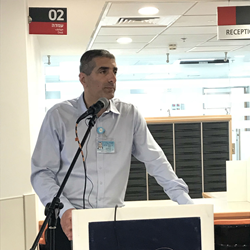 Israel’s national hospital, Sheba Medical Center, today officially inaugurated a new wing of emergency room suites to expand the capabilities of its leading gynecology and maternity center. The care for patients at Sheba Medical Center is not just about our advanced technological advances, it is also about the love, respect and compassion of the men and women who dedicate themselves around the clock to serving our patients. Sheba Medical Center, Tel Hashomer today officially opened a new set of state-of-the-art emergency room suites located in the Josef Buchmann Gynecology and Maternity Center. The event was celebrated with a ribbon-cutting ceremony led by Sheba Director General Prof. Yitzhak Kreiss. In attendance for the special occasion were some of the most dedicated supporters of Sheba from across the United States, Canada and Europe. As Kreiss explained during his remarks at the ceremony, mothers and their babies have one of their first and most important interactions with physicians when they arrive at the pediatric emergency room, which underscores the importance of these new facilities. This week, dozens of dedicated Sheba supporters from the U.S., Canada and Europe are in Israel participating on a mission being hosted by Sheba’s leadership. The Friends of Sheba are touring different parts of the hospital to learn more and understand the impact that the Middle East’s largest and most advanced medical center is having every single day. Born together with Israel in 1948, Sheba Medical Center, Tel Hashomer is the largest and most comprehensive medical center in the Middle East. Sheba is the only medical center in Israel that combines an acute care hospital and a rehabilitation hospital on one campus, and it is at the forefront of medical treatments, patient care, research and education. As a university teaching hospital affiliated with the Sackler School of Medicine at Tel-Aviv University, it welcomes people from all over the world indiscriminately.